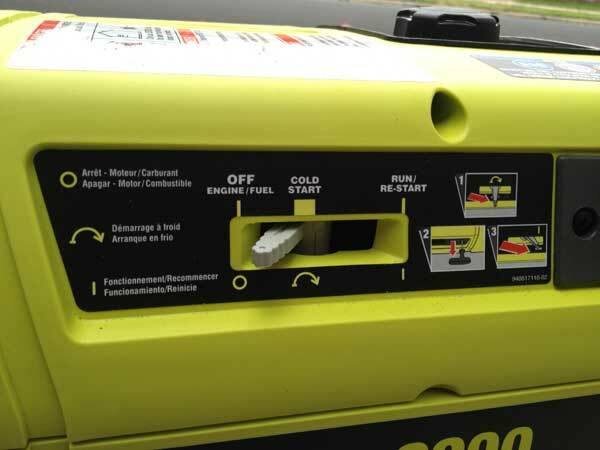 We’ve been pining for a compact generator for awhile now and Ryobi graciously allowed us to test out their new RYi2200 inverter generator that is available at Home Depot. Southern California has it’s share of natural disasters but nothing like the seasonal flooding, tornados and winter storms that can hit the rest of the country and knock out power for days. This compact home generator isn’t setup to power your home but rather give you power on the go while camping, tailgating or on a jobsite. It offers 2200 starting watts/1800 running watts and if you buy two you can run them in parallel for even more power. One of the best features on this generator is the idle-down technology that adjusts the engine based on the power used which saves fuel. It weights in at 51 lbs so it’s light enough to put in your truck and there are two handles on each end to lift as well as an extendable handle for pulling just like your luggage. Starting the Ryobi was a cinch. It’s got an easy pull-start that anyone could use and the three stage running lever keeps things simple. We wish the unit had a fuel gauge as it already has a helpful oil gauge and the access to the oil refill reservoir could have been easier instead of having to remove a couple screws. Overall this is a solid unit that is priced well below many of it’s competitors. It’s easy to use and runs extremely quiet. With a 3-year warranty it’s tough to beat. Here’s a quick video showing more features and highlights. You can enter here to win this inverter generator.